This past weekend I had the opportunity to speak at the inaugeral meeting of the HAL-PC (Houston Area League) Palm user group. 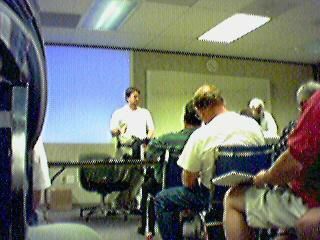 I had never been to a special interest group (SIG) meeting before, much less presented at one, so it was quite an interesting experience. Two representatives from Palm and 3COM went before me, talking about the new Palm m100 and Palm VIIx products. By the time I presented, the meeting was mostly Q&A, so the "transcript" below wasn't necessarily spoken word-for-word by me (so it wasn't this dull), but I wanted to say it. Everyone seemed to be very interested in the OmniRemote and memory storage issues. For the products I mentioned, I have linked to their reviews where you can obtain more information. If you wish to go to future Houston meetings, they occur on the 2nd Saturday of each month. I won't always be there, but I'll try to stop by every once in a while. Hello everyone! I’m James Hromadka, the Senior Editor at VisorCentral.com, which, in my opinion, is the best website for information on the Handspring Visor and its products. I’m glad to be here today to have a chance to speak with you, since I know that most of you are just as interested in the new developments in handheld technology as I am. I’d like to tell you a little bit about our website and my personal involvement in it, and of course tell you about some of the great products that have been released for the Visor. VisorCentral was created for Peracto, Inc. by Marcus Adolfsson out of Gainesville, Florida. He created the initial site on September 8, 1999; right after ZDNet broke news of the Visor’s announcement that would officially be a few days later on the 14th. As I was interested in VisorCentral, I emailed Marcus whatever news items I had found on the web. The site really took off when its Discussion Area (bulletin board) began. There was a lot of buzz about Handspring, and major news sources such as CNN picked up the Visor announcement and linked to VisorCentral, giving us thousands of visitors a day right from the beginning. At the beginning, the elation over the Visor turned into scorn as many of our readers had problems getting their Visors. At one time one of our readers had running statistics on the average length of time that it took to order and receive a Visor. That time length went from over 40 days during December to less than a week earlier this year. Now it’s hard to imagine any difficulty getting a Visor, but they were going for $300-400 on eBay at one point!